Also if you're trying to source a fast Sandisk reader, make sure you get the right one - not all of them can get to the Extreme speed. Other option is to get USB 3.0 reader. "I know some of you are trying to find the fastest memory cards for your Panasonic GH1s and 2's, as well as some other video camera's. So, I recently placed an order from a major online retailer for 2 Sandisk 32GB SDHC Extreme III, 30MB/Sec memory cards. The picture online showed the older style memory cards, without the HD Video, or UHS-I printed on the card, and that's what I wanted. What I got, where the UHS-I, HD Video memory cards. I was pissed. Well, there is something that Sandisk probably does not want you to be aware of. Their newer, Extreme SDHC UHS-I cards are slower, than the older Extreme III cards. And not by a little, but by a lot. Keep in mind that UHS-I was developed to increase speed in devices capable of using this new feature/memory controller. I don't have one of those camera's. I also don't have USB 3.0-so this new feature is lost on me. So, here's what I did; I decided to test the "new" cards, against an older, Sandisk 16GB Extreme III, 30MB/Sec card. And, just for fun, I also tested a much older Kingston 16GB Class 4 card. The card reader was a newly bought Sandisk ImageMate(model 199A), which is optimized for reading Sandisk cards. The computer is a PC running Vista 64. I used Crystal Diskmark, as my bench test, running 5 tests, each with 100mb. Each card was formatted in the card reader with standard sectors in FAT32 before the test. I should also note, that my brand new card reader died, shortly after performing the tests-so it's being returned, as well as the "new" 32GB cards. And, just for fun, the read write speed of my SD800 Panasonic video camera, used as a memory card reader, with the 16GB ExtremeIII cards was; Read=16MB/Sec Write=14MB/sec. So, why are the "new" memory cards not performing at 30MB/Second like the old cards?? Good question. Why am I paying for the new UHS-I technology, when clearly, a Kingston Class 4 card is nearly the same speed, and I'm sure a Kingston Class 6 card would be identical. Keep in mind that the class rating is a minimum, and it's normal for most cards to exceed this. Also keep in mind that USB2.0 is limited in it's speed as well. I am returning the "new" Sandisk cards tomorrow, along with the broken memory card reader. I will probably purchase the cheapest class 10 cards I can find." @jspats, i use the sandisk extreme pro 45 MBs 32GB without problem at all. And your card reader, and see how fast it really is. 45MB/sec is faster than most camera's can write. It's also faster than USB 2.0, I believe, can read/write. I'm not saying these camera's are a problem-I'm saying they are misleading people into believing that they will get 30, or 45mb/sec read/write speeds. The truth is, you probably won't come near that. SanDisk Extreme SDHC UHS-I 32 GB -> 4GB Spawning works...! Both using the exactly some modified Firmware. ...except, that im using 32GB @ 30 MB/s Versions...! @havasuvideo - I have the 45mb Sandisk 32gig and it works awesome...You must have had a fake card or something lots of fake sandisks out there. Don't think so, got both Cards from same trusted shop, where i also get my cam from! I don't mean the Extreme Pro Version, i think you missunderstod! Yep, the one on the left is what I ordered, the card on the right is what I received and returned. They were not fake, they were bought from a big name online retailer. UHS-I may have it's place....but, it's not for me. In my opinion, Sandisk is selling the UHS-I version like it's the old 30mb/sec version, and it's not. It's closer to a class 6 card. And, I'm not worried to much about the write speeds, I wanted the faster read speeds, so I could download things off the camera faster. I can save myself at least $50 by going with a cheaper set of 32GB cards, and still be around 20mb/second, which is where the UHS-I cards tested at. I would be curious how fast the Extreme Pro UHS-I 45mb/sec cards tested out at. That's on a USB 2.0 set-up. Sorry I misunderstood...I don't have a "good" card reader- just a cheap 5 dollar one... but I would be willing to test mine on flash memory tool or something. I have been testing the 132 mbit extreme patch with Sandisk Extreme Pro 45MBs 32GB and have not been able to make it crash whereas the transcend class 10 stops in 1 to 5 seconds. No spanning but full 4GB 5 minute files with a few different lenses and subjects. Should I have posted this in the extreme settings thread? I am currently running 3.61, but would like to move to 3.62 due to some recent breakthroughs, but I need a fast card first, as I am running class 6 transcend right now. I want to go straight to the top-of-the-list fastest card I can get so I don't need to buy more later. Please someone confirm or point me to the best card (16GB is what I'm after), Thanks. Sorry to bother . . . but the info on PView about optimal SD cards is all over the place, and most of it is long back-and-forth with some contradicting information. Yes, BHPhoto prices surprised me a bit, that is why I asked. I will order the Sandisk E today, and upgrade to ptools3.62 when they arrive. this is the best price I've ever seen for these. Looks a great deal. Just wish I still lived in the US as their prices are pretty extortionate - I'm sure it really doesn't cost THAT much to ship 2 SDHC cards to the rest of the world!!! Yeah the yanks seem to get the better deals all right…in many areas, no doubt. The 16 GB Sandisk Extreme on the B&H site is $46 and yet costs $139 here in Vancouver. I mean WTF?! Our dollar is worth more than US. @davhar It's frustrating seeing all this cheap stuff in the US. I'm not an economist but it genuinely intrigues me (and annoys me, because I don't live there any more!) that more or less everything you care to name is so cheap there compared with the rest of the world. Wish I knew how the US sustained that. After reading your comment I just read over my last one and it sounds terribly bitter or angry and I'm not that at all, but it is, as you say, "frustrating" that everything is so much cheaper in the states than here. Economy of scale perhaps. But even the gas they get from Alberta is cheaper than here. Anyways I was wondering whether to buy a couple more Sandisks or wait till the firmware or hack gives us a full HDMI output and get a Ninja recording device and monitor in one! What do you think? 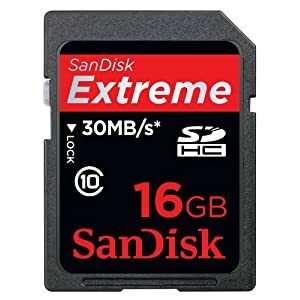 I bought a SanDisc ExtremePro SDHC 45MBits/sec card from amazon ( https://www.amazon.co.uk/SanDisk-Extreme-UHS-I-Memory-45Mbps/dp/B004JJN262/ref=sr_1_8?ie=UTF8&qid=1315650659&sr=8-8) and I find it will not write quick enough using the recommended settings in PTool3. Stops recording after a few seconds and the camera is locked (have to remove battery to stop). It should have been fast enough I thought, but perhaps I got the wrong card. I notice it doesn't say Class 10 on the card - perhaps it's not suitable - or it's faulty - or a fake. Any comments anayone?